Workers in big cities like New York City always face the same problem every day before going to work and that is – traffic. It eats too much of your time, energy, and money. As soon as you reached the office, you are already exhausted from getting stuck in traffic jams during rush hours. And not only that, expensive renting office space is another problem faced both by large and small companies. Not a problem for those who can afford, but for those who can’t – it is. If you are looking for an affordable space for rent for your satellite office with additional perks and flexy payment within New York and can save you hundreds of bucks. Well, BridgeWorks got your back. BridgeWorks is a first of its own modern workspace for rent located at Long Beach Blvd. in Long Beach, New York. Yes, it’s a little far from the heart of New York City, but it’s a walking distance from the beaches and a bike away from surfing spots if you like enjoying scenic ocean views. It’s strategically located near the 2 train stations namely Long Beach and Island Park, and Long Beach Bridge for your convenience. Since it’s a beach town famous for its boardwalks and surfing spots, you can unwind from work in your free time. In addition, the island has restaurants where you can grab a bite, and bars and pubs where you can hang out with your colleagues during night outs. It gives you the comfort to do your work away from the noises and stresses of city life. Sounds refreshing, right? In BridgeWorks, you can rent private offices good for 2-4 people and executive suites with indoor showers depending on your needs; a capacious co-working space for creating noble ideas and collaborating with other inspiring professionals; an open cubicle dedicated for you if you want to work privately; conference rooms for private meetups; a virtual address with mailboxes and call routing services to give your company a solid identity to your client; and an event space that can hold from 45 up to 99 people. The facility is well-designed interiorly to create an office ambience where you could work comfortably. Bridgeworks comprises of two adjacent buildings to accommodate your needs for an office space. The one at 670 Long Beach Blvd. is an executive suite while the other at 780 Long Beach Blvd. 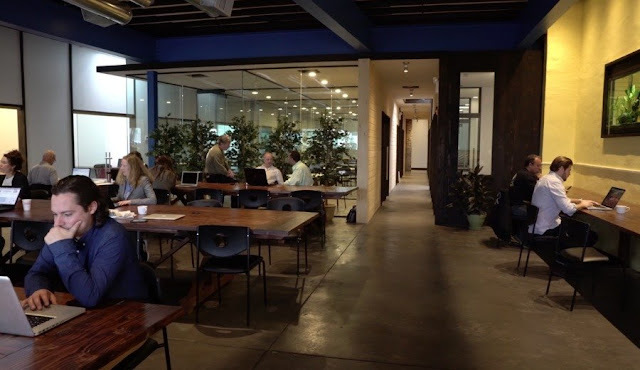 comprises the café, private offices, conference rooms, and co-working space. Bridgeworks also offers membership packages which starts as low as $45 up to $3000 per month with amenities including occasional catered lunches, personal lockers, free coffee, phone booths, fast wifi connection, parking space, bike racks, surfboard storage, and a whole lot more. If you’re still hesitant about it, BridgeWorks offers a one-time daily and weekly pass to give you an experience of their facility for $45 and $75, respectively. If you don’t want to spend a penny, you can book a tour to see the place for yourself. Bridgeworks’ App is available in android and iOS so you can always check your membership account and make reservations online if you have one. In Bridgeworks, you can do your work at the same time live your life through mingling with the professional community or locals in the area. The place is all about creating a balance and convenient working environment. For more information, you may visit their site https://bridgeworkslongbeach.com/.